Welcome to Garden Bloggers' Bloom Day for June 2015. 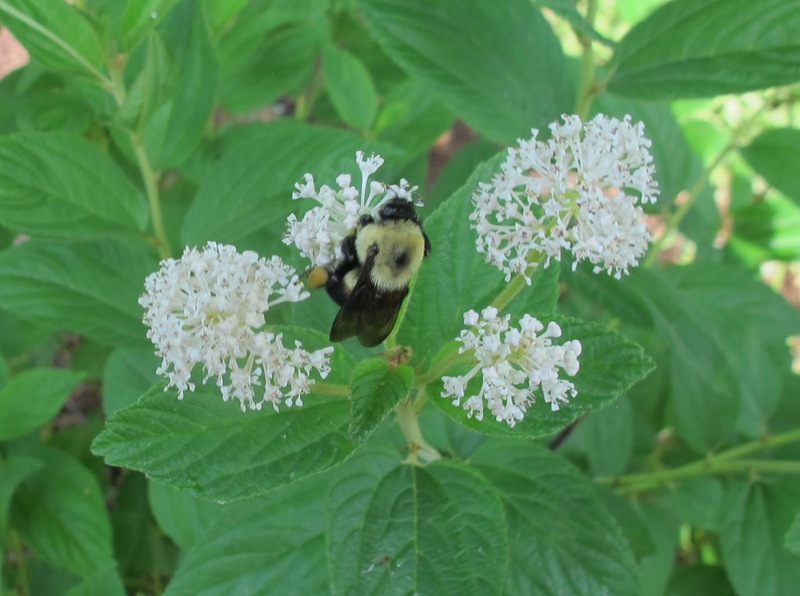 If you came in person today to my USDA Hardiness zone 6a garden in central Indiana, we could sit in the garden and listen to the buzzing of bees and the songs of the birds while sipping iced tea. And we could talk about flowers and plants, of course. I have a "tea" of sorts blooming in my garden today and the bees love it. It's the native shrub Ceanothus americanus, also known as New Jersey Tea. Another name for it is Red Root. One is advised to carefully chose its location because it has strong roots and won't be easy to move later on. I guess I like it's location. I know the bees do. This is the first year I've really noticed its blooms, and they remind me of another one of its common names, Wild Snowball. Moving on, I spent some time this morning actually picking June flowers and bringing them inside to enjoy. I tip my gardening hat to Debra Prinzing who has started a whole movement called Slow Flowers. "Slow Flowers is a movement to help people find the best U.S. floral designers who are committed to sourcing from American flower farms. Together, we can help American flowers flourish!" The idea is that wherever you are, whether it be the United States, Great Britain, Australia or any place else, look for local flowers, just as you would look for local foods. My June bouquet contains several varieties of clematis, a daylily, a daisy, betony, yarrow, perennial sweet pea, veronica, and coreopsis along with hosta leaves and the leaves of prairie dropseed, Sporobolus heterolepis. I will enjoy them for as long as they last, whether it is through the dinner hour or a week. Would you like to see some of the blooms actually in the garden? There are multiple Clematis competing for my affection. 'Rooguchi'' has great bell shaped flowers. But 'Pagoda' has so many blooms. I suppose I don't have to choose, which is a blessing because I cannot decide on my favorite one. Elsewhere in Plopper's Field, where I plop perennials in wherever there is a gap, the first daylily, other than 'Stella D'Oro', is blooming. It's 'Longstocking' and it is always first. Over in the August's Dreams garden border, I snuck in some June blooming swamp milkweed, Asclepias incarnata, last year. I'm hoping a Monarch butterfly or two or a dozen will find it. They are most welcome in my garden. To add some color to this garden border before August, I added a new sculpture made out of an old plow part. Out in the Vegetable Garden Cathedral, where I grow vegetables and some flowers, I planted borage this spring, so I could enjoy the blue flowers. I've been told once you plant borage, you have it for life. Good. I want it for life. I also want tomatoes, and these blooms are a good sign I'll soon have some tomatoes to pick from my garden. What else is going on in my garden? A lot, too much to go through in one post. Let's just say it's been a wonderful spring and I am happy with how the garden is growing so far. Now, come virtually sit with me in The Shrubbery and we can talk about what else is blooming not only in my garden but in gardens around the world on this 15th day of June. The Shrubbery where two Cotinus sp reign. Join us for Garden Bloggers' Bloom Day and share what's blooming in your garden. It's easy to participate. 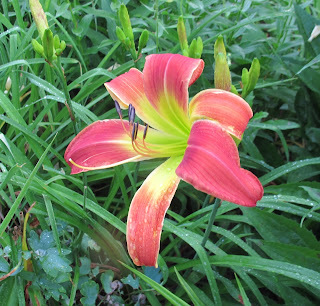 Just post on your blog about your June blooms and then come here and leave a link on the Mr. Linky widget and a comment to tell us what we have to look forward to when we come for a virtual visit. Happy Bloom Day.....Love the chairs and My mom loves the pinwheel...thanks again for hosting and happy bloom day. Your gardens are so beautiful this June and the two Adirondack chairs are just screaming "sit here" and visit! Thank you for the lovely views and for hosting Carol! Your lime green chairs look wonderful against the Cotinus shrubs. I have Pagoda dogwood trees and trout lilies. I think I have to add that fabulous Clematis. It's new to me but I definitely need to check it out. Happy Bloom Day to you! I hope the monarch's find you too! Happy GBBD! Love your bell-shaped clematis flowers, so beautiful. Oh, and I grew up with Pippi Longstocking and her antics, the hemerocallis surely must be named after her :-) Happy GBBD! Everything is lovely — especially nice clematis choices! All those flowers are so gorgeous, love the chairs in among the the garden! I'm glad you are finding the time to sit and stare Carol, or at least think about it! This wonderful part of the gardening year is over so quickly, we must take the opportunity to just breathe it all in once in a while. After doing a little research on the cut-flower industry for a Valentine's Day article, I was floored by the distance most flowers travel, as well as the energy and materials needed to make it happen. So yes to slow flowers. I missed last month's GBBD, so I am making up for it with an excess of photos. Thank you for once again hosting. 'Roguchi' has become one of my favorites, but all your clematis look lovely. None of mine are blooming yet, which seems strange. Love the lime green chairs and the pinwheel! You can come sit in my garden, too, Carol, but these days you'd better bring an umbrella:) Happy Bloom Day! Beautiful! I am enjoying my clematis, oakleaf hydrangea, and moonbeam coreopsis, and my other hydrangea are just beginning to bloom. I have some little tomatoes on some of my plants. Yippee! The clematis are my favorites. It must be a good year for them. The Longstocking daylily is making me want to go out and get some sherbert. Apart from your blooms, I can't help but admire those chairs in the last shot. The colour is just lovely. Your garden is really showing summer signs where as mine's is weeks behind and it still feels like spring rather than summer. Still, where would the fun be is each year was the same. As usual, thanks for hosting Carol. I love the idea of local flowers for arrangements. And you have some lovely ones to choose from. Thanks for hosting Bloom Day once more, your garden is looking very summery at the moment, it is a wonderful month for flowers isn't it! Love the seats, they look very inviting! Love that carpenter bee shot!! Happy bee. Your clematis are stunning; I think I need to find a place for a native Texas one that can take our heat/drought/floods! Thanks once again for hosting this fun meme for blooms! Those chairs in your garden look so inviting! Your Asclepias incarnata is so early! Thank you for hosting again! Your new sculpture is cool, your arrangement very pretty! Your daylilies beat mine- I've only got buds. Thanks for once again hosting GBBD and for inviting us into your beautiful garden! Your arrangement is a great way to show the variety of blooms in your garden this Bloom Day. 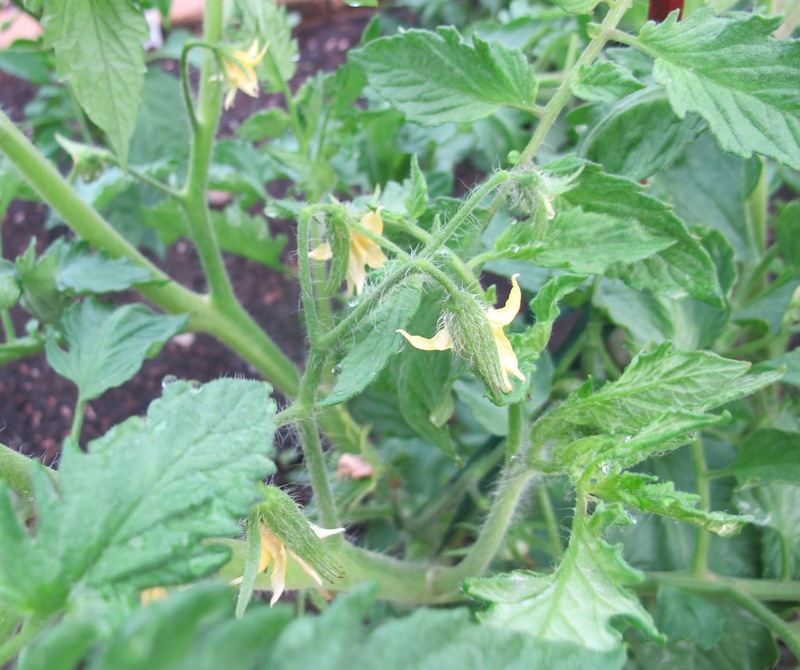 Super idea to include your tomato blossoms, a preview of good things to come. I would love to join you for 'tea' in the garden and I would really drink in the sweet smells of all your June flowers. "Let's just say it's been a wonderful spring and I am happy with how the garden is growing so far"...those are very contented words Carol. Love that white clematis. What a lovely oasis - I'd join you like a shot and bring cake! Happy Bloom Day, thanks for hosting. Our gardens seem to be in a similar spot Carol although my veg garden is behind due to earlier cold weather in spring and the deluge of rain we have been having. I actually am participating in a meme where we pick flowers from our garden weekly and bring them indoors...a wonderful way to keep our flowers blooming with us....wishing you a great week ahead and summer! I LOVE those Clematis! Seeing your Borage made me wonder where mine went this year - they're such prolific self-seeders, I didn't think they'd ever just disappear. Thanks, as always, for hosting GBBD, Carol! Wouldn't it be wonderful to visit all these gardens? Love the new sculpture. I am looking for something funky for my new kitchen garden. You know how it is , when you see it you know its right. Lovely to see so many gardens around the world, thank you for the Bloom Day idea! This is my first ever Garden Bloggers Bloom Day...just started my garden blog last month. It's so interesting to see the same plants that I am growing, but at a different level of maturity. My tomatoes are getting close to finishing up and yours are just blooming. I also have clematis and I think the same daylily you posted. Your clematis vines are gorgeous, I grow it here in zone 9 just because you rarely see it here...I like to push the boundaries. Thank you for hosting. Everyone's garden is looking so lovely. Spring is over here in Houston but I found some fun blooms. Thank you for hosting! Happy Gardening! I was inspired to go see what my 2 year old New Jersey tea plant is doing, by your photos, I was happy to see it is getting taller and has flower buds coming at the end of most of the branches. I'm excited to see it bloom, the butterflies should like it. I love the shape of the Rooguchi clematis, such cute bells. My tomatoes and self-sown borage are not blooming yet, but soon. I do have peas and a few squash blossoms. Lovely garden! My garden is buzzing with bees this month, too, though I think we are a bit behind you in terms of flowers - my tomatoes aren't at that stage yet. Any readers in the UK who are in search of slow flowers might like the Great British Florist site. You reminded me that I NEED 'Rooguchi' in my Clematis collection! Such an enchanting flower and I think it will be perfect next to my faerie garden. I found that same "old plow part" at a local flea! Happy Bloom Day, Carol. Thank you again, Carol, for the invitation to join in this monthly review. It is a treat to see what others are doing at this time of year. Managed to get the photos uploaded by 11pm. Can't wait to visit your gardens. Happy Bloom Day! I'm so excited for tomatoes. They're one of the few reasons I'm willing to put up with summer heat. I love the different varieties of clematis! My grandmother was just showing me hers and it looks so different from the Rooguchi, which is awesome! Thanks for hosting the bloom day! I don't know what happened, but I tried to link in earlier today and it didn't work. The link list seems frozen on my computer at 50 entries where it was when I tried to link. Happy Bloom Day! Thank you for hosting, I'm anxious to go see what's blooming in all the other gardens. Your day lily is beautiful! I don't have any day lilies. Yet. Hi Carol, I love your bouquet - so exuberant. Your garden seems, as usual, to be nearly two weeks ahead of mine, but it's hard to tell, really. I love your dedication to the Bloom Days and enjoy reading your posts. Happy Bloom Day! I get so much inspiration from what everyone else is growing. I really like your bell-shaped clematis. I've got a few places that I think need a clematis. I'll have to keep that one in mind! My first time of joining in with your meme, I struggle to view blog posts with our snail pace internet speed, but really glad to finally join in. Thanks for hosting this carol. I cannot add my link, but have posted some colourful flowers from Australia. Havent joined for ages, have a great colourful weekend! I have the biggest salvia you ever saw in my late BloomDay post. It's good to see your tomato flowers: this is the first year I haven't grown any and I'm already missing them.Thank you for hosting GBBD, Carol! I am super late, but took all the pictures on time, so does that count? I'm amazed at your clematis - the single one I've gotten to grow so far was finished blooming a few months ago. Thanks for hosting GBBD! I'm a bit late to the GBBD party as I've been a-Flinging and holidaying in Canada. My post went up on the 15th and it turns out the subject of my post was discussed in some detail on our Fling visit looking at habitat restoration at High Park! Borage is one of my favorites. Thank you for hosting another GBBD.